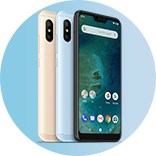 [Announcement] [WARNING] The Risk of Unlocking and/or Flashing Mi A2 with Mi 6X ROM. [ROM] Personally, how do I get MiA2 lite to stay with miu10? [Discussion] a2 lite supports quick charge? [Announcement] What do you think about how Xiaomi managed their AndroidOne device? [Discussion] The OTA updates stuck the Mi A2/Lite phones.